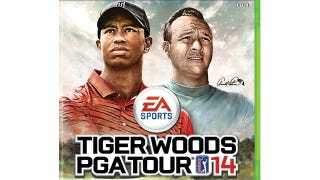 Mea culpa: When Tiger Woods PGA Tour 14 revealed its cover stars yesterday—Arnold Palmer and Tiger Woods—I missed the biggest news in the cover art: Its basic course roster has gone up to 20. That's four more than the 16 the game has usually included in its standard version for high definition consoles, with about another 16 offered through downloadable content. Courses take up a lot of space on the disc, and I was told that a format update Microsoft pushed through around this time last year allowed EA Sports to jam 20 courses onto the Xbox 360 HD-DVD for the Collector's Edition of Tiger Woods PGA Tour 13. Upping the course count to 20 in the basic version is probably good PR for a series that got cuffed around when the Augusta National Par 3 course was held out as downloadable content, after being in the main game the year before. The new Course Mastery system, which actually allows gamers to play and even acquire DLC courses for free, was largely misunderstood at launch and portrayed as a kind of perpetual greens-fees scam. The Par 3 course is, again, being held out for the "Historic Edition," which will cost $10 more and whose content will be available as paid DLC. But a 20-course menu is a nice gesture, at least. The full course list has yet to be revealed; one assumes that with Arnold Palmer appearing on the cover—and in the game for the first time in eight years—his home course of Bay Hill will return to the series, having last appeared in Tiger Woods PGA Tour 11. The Arnold Palmer Invitational may even be a named event in the game's career mode. Other details emerged from today's announcement of the game's "Historic Edition," notably that Jack Nicklaus will be a playable golfer in this game. (A 1986 Jack Nicklaus also is being offered as a pre-order incentive from Best Buy.) The historic edition will add another six courses, including a recreation of Augusta National in 1934, the year of the first Masters Tournament. With Nicklaus in the game for the first time since Tiger Woods PGA Tour 06, golf fans should expect some kind of centerpiece featuring him, Palmer and Woods. Woods' goal of besting Nicklaus' record of 17 major championships featured prominently in Tiger Woods PGA Tour 13's "Tiger Challenge," which was partly a recreation of key moments in Woods' career and partly an idealized future for it.